This newly renovated boutique hotel in Kitchener Waterloo is stunning for photography. Based in Meaford we regularly photograph weddings in the Kitchener Waterloo and Cambridge regions. This wedding venue is ideal for your all in one wedding day or choose this hotel for your bridal preparations. The light at The Walper Hotel is stunning and dramatic. Moody light in hallways and staircases and bright light in rooms and the lobby. Get a great variety in your wedding photos at this stunning boutique hotel. We photographed this bride with a video light while she put on her shoes for additional drama and something different and creative for our bride that not every wedding couple would have in their photography collection. This wedding photo during bridal preparations has won numerous awards. Photographed with a 24-70mm lens and in a journalistic style. This image was not staged and has already won many awards. Window light on days when it's raining or cold is ideal in boutique hotels with wide open spaces. Hotels with large empty rooms will accommodate large wedding parties as well as large families for indoor photography. The Walper Hotel in Kitchener will give you this kind of light for your indoor photography if needed. The decor in hotel rooms may not be the best in photography so choose a photographer that is experienced in photographing with low budget accommodations or rooms at The Walper Hotel in Kitchener. This gorgeous moment photographed with mother and daughter could be anywhere but we photographed this at the Best Western in such a way that the moment was highlighted and not the room. You too can get moments photographed like this at The Walper Hotel in Kitchener. Bridal portraits in hotel rooms with mirrors and great light. This bride choose a multi tiered, trimmed veil with blusher for her bridal portraits. The veil stayed on until after the ceremony bridal portraits and she removed it for the reception. This style veil is a perfect addition to your bridal look for wedding photography. The window light and large mirror in this bridal suite worked perfectly for this wedding photography session. 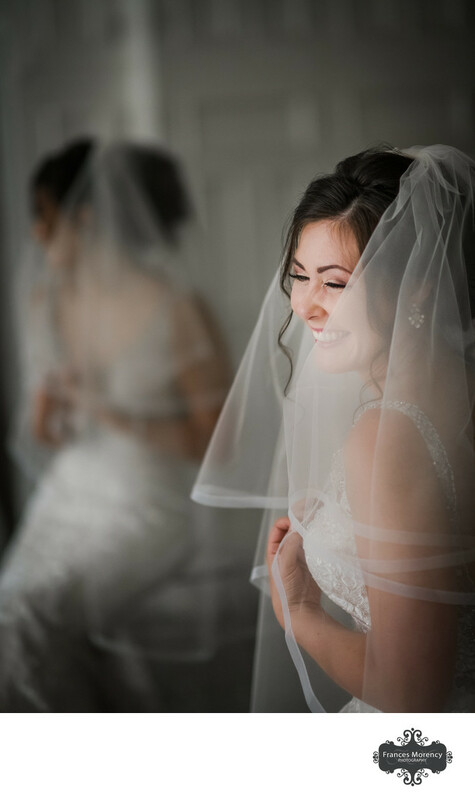 Brides getting ready in small hotel rooms is very familiar to us and we are experienced in photographing bridal parties in any kind of light or location. Hotel rooms vary in window light and decor and we have to be ready with a creative eye to produce stunning images wherever we are in Kitchener Waterloo. Location: The Walper Hotel 20 Queen St S, Kitchener, ON N2G 1V6. Keywords: bw (45), hotel (6), Kitchener (6), The Walper (3). 1/200; f/4.5; ISO 5000; 44.0 mm.